Betty and Veronica, the two grizzly bears who have recently moved from the Bronx Zoo to take up residence at the Central Park Zoo, have been local media stars lately, appearing in the New York Times, the Post, and on several news stations. 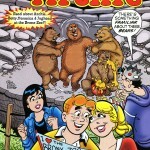 But these two are no strangers to fame: in fact, in 2004, they were the cover stars of Archie Comic No. 550. 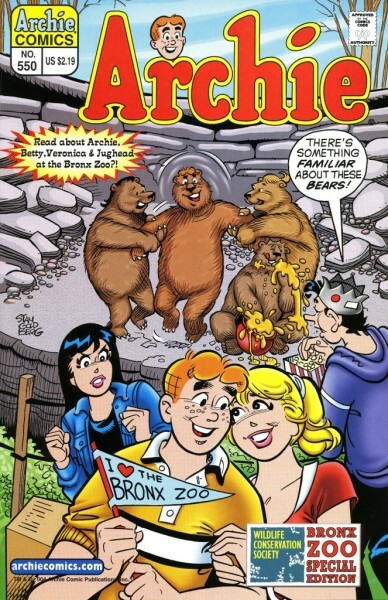 In the issue’s first story, “Bear in Mind,” the human Archie, Jughead, Betty, and Veronica visit the Bronx Zoo to see their bear namesakes, who were taken in by the Zoo in 1995 after facing threat of euthanasia under US Fish and Wildlife’s “three strikes” rule. The gang from nearby Riverside learns about the dangers facing wild grizzly bears and about the Zoo’s Animal Enrichment Program from WCS Senior Conservation Scientist Joel Berger and Bronx Zoo keeper Jeff Munson. Steven Colbert’s report on Betty, Veronica, Archie, Jughead and Jeff Munson is priceless.